Welcome to this site! I have been a practicing music therapist and psychotherapist for more than 25 years. Growing up, I was fortunate that my home and school life were filled with creativity and music. From an early age, I was also exposed to various issues and life situations that created challenges and sometimes made me feel different. These experiences nurtured an inner sensitivity and motivation to help. In retrospect, it is clear that becoming a psychotherapist and a music therapist was a natural calling! I studied psychology and music (voice and piano) as an undergraduate and received my masters in music therapy in 1989. I have, and have always had, an eclectic practice, which I believe benefits all of the individuals and families with whom I partner. I hope you will browse through this site and find what you are looking for. Please do not hesitate to contact me for more information, to provide feedback on what you discover here, or to arrange an initial consultation. Thank you. Everyone responds to music! Music therapy and music psychotherapy have been proven to be a highly effective treatment for every age, stage, and challenge. This website will provide you with information about music therapy and music psychotherapy. It will inform you about how the use of music within therapy is particularly well-suited to ameliorate a variety of issues, needs, and challenges. No previous experience or skill in music is required to reap the benefits! As a therapy it is unique in its ability to open up avenues of self-awareness, self-expression, and communication that can lead to improved functioning. It can be an active and process oriented therapy that employs singing, listening, moving to music, songwriting and playing instruments that do not require any skill or previous training. It is different from music education, music lessons, recreation, and entertainment. Although music therapy and music psychotherapy may share common aspects with these pursuits, it is fundamentally distinct because of its emphasis approach and aims. 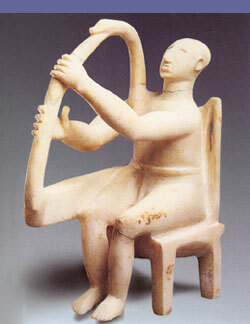 a stringed instrument like a small U-shaped harp with strings fixed to a crossbar, used especially in ancient Greece. Modern instruments of this type are found mainly in East Africa. The use of music in the service of health has roots that can be traced to every ancient civilization; indeed music as a means of therapy is universal-it can be found in every culture on earth-and has been used since the beginning of human history.